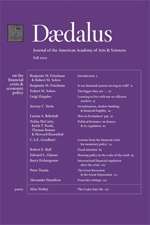 Dædalus is a peer-reviewed academic journal founded in 1955 as a replacement for the Proceedings of the American Academy of Arts and Sciences, the volume and numbering system of which it continues. In 1958 it began quarterly publication as The Journal of the American Academy of Arts and Sciences. The journal is published by MIT Press on behalf of the American Academy of Arts and Sciences. Each issue addresses a theme with essays on the arts, sciences, and humanities. Special features include fiction, poetry, and a notes section. Publication is by invitation only. The journal is indexed in Scopus and the Social Sciences Citation Index, among others.